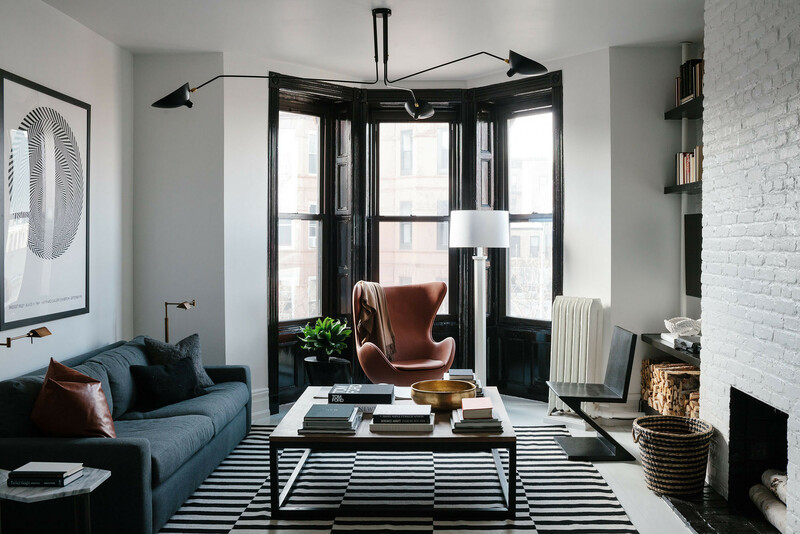 For a Brooklyn brownstone apartment, designer Dan Mazzarini melded historic architecture and modern-masculine furnishings in a strict palette of black and white. Homeowner Joe Mazias, holding his chocolate Havanese, Animal, with Mazzarini. There are few things as thrilling or as potentially terrifying at the beginning of an interior design project as a blank slate. Luckily for Dan Mazzarini of BHDM Design, that proposition also came with a trusting client, his friend Joe Mazias, and an apartment that was, in the designer's words, "kind of a slam dunk." A structurally sound, aesthetically vanilla two-bedroom in the Park Slope neighborhood of Brooklyn was well within his wheelhouse. 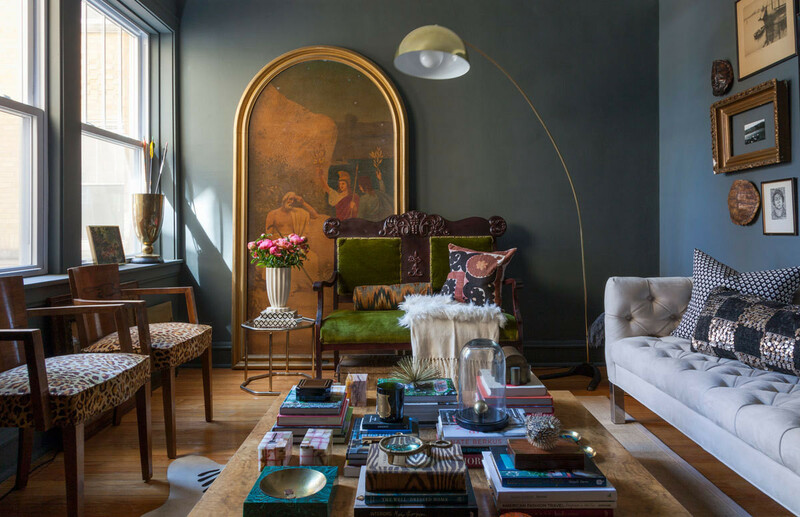 For his first home in the hip borough, Mazias chose a place that fits the real estate archetype many a Manhattanite dreams of when crossing the East River: a classic Brooklyn brownstone apartment in a picturesque neighborhood. The place was in good shape, if a bit dated, so the pair settled on an aesthetic overhaul throughout. The apartment's feel had to mimic Mazias's personal style—formal during the week and kicked back on the weekend. Thus, an orderly black-and-white respite for a buttoned-up lawyer, and a cool and welcoming crash pad for his frequent out-of-town guests. The glossy Ikea cabinetry is accented by bronze hardware and a honed-marble herringbone backsplash. 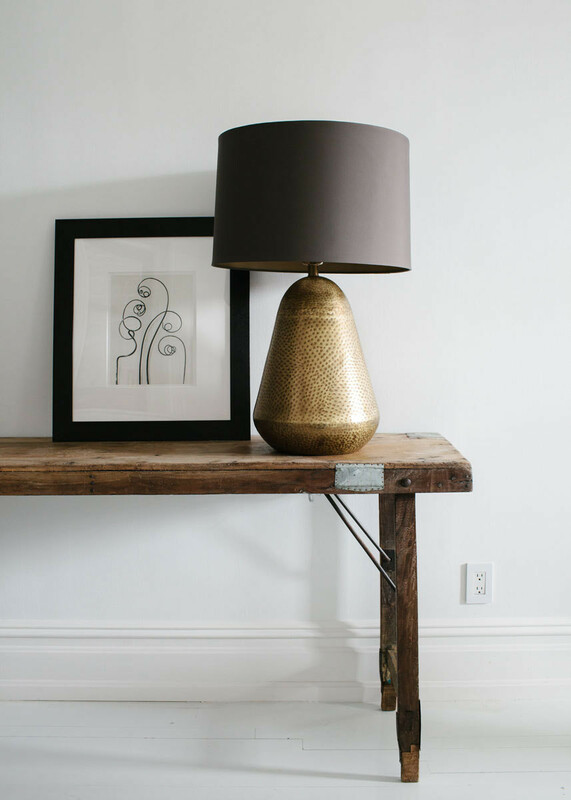 A rustic wood table finds a glamorous partner in a textured gold table lamp. Mazzarini's vision for the space included a full renovation of the outmoded kitchen and bath, a statement-making coat of glossy white for the floors, and a masterful mix of contemporary, midcentury, and antique furnishings, all rendered in reserved neutrals. "We wanted to keep the character, but update it for his lifestyle," says the designer. Some builders' special finishes betrayed a recent but soulless renovation, so the design team replaced the doors, trim, and floors throughout in styles that stayed true to the history of the building. The kitchen received the biggest transformation. 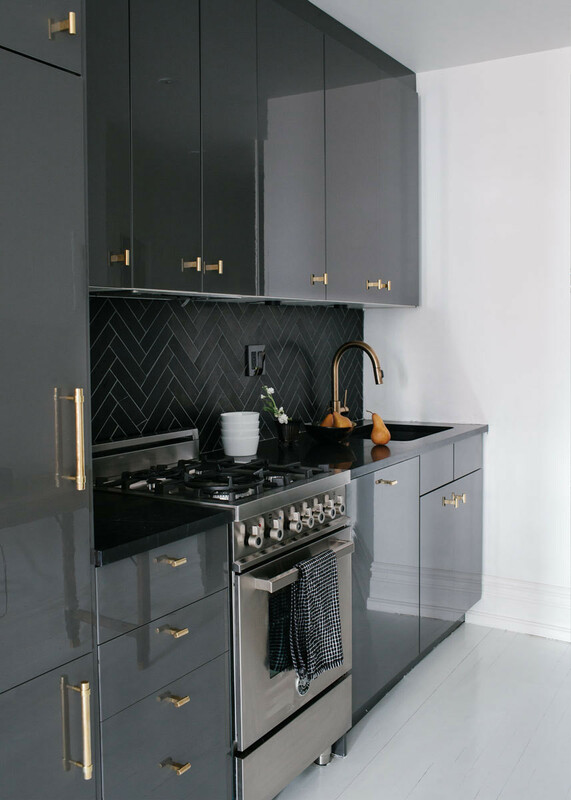 Glossy cabinetry (an unrecognizable Ikea hack), bronze hardware, and a honed Nero Marquina backsplash in a herringbone pattern make an unabashedly luxe and modern statement against the otherwise eclectic decor. 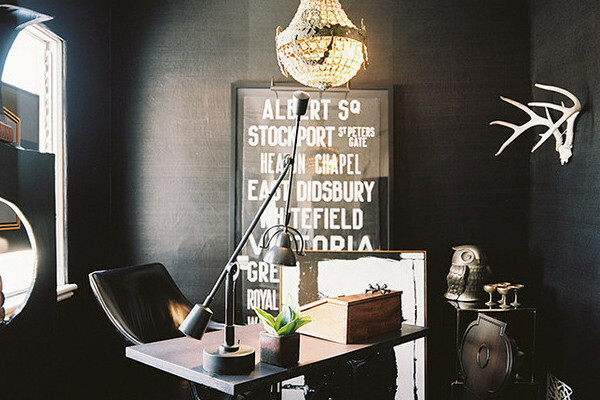 The strict color palette of black, white, and gray, which reigns throughout the home, helps to maintain the cohesive feeing. "Neutral doesn’t have to mean monochrome," Mazzarini points out. And in this case it's far from one note. 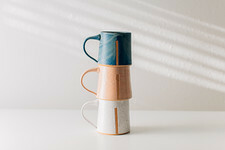 Bold geometric shapes, like the ones found on the new bathroom floor or the master bedroom's standout door knobs, lend the place a bespoke air. "Joe didn’t want it to feel like 'ye olde Brooklyn.'" says Mazzarni. "There’s a sense of history here, but we polished it up." 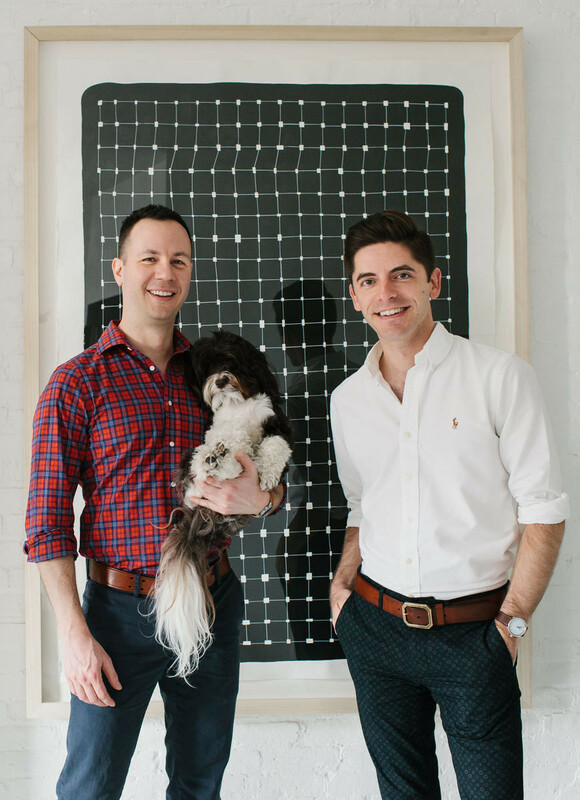 The most old-world element, a simple brick-lined fireplace, received a coat of white paint, as did the wood floors, creating a bright backdrop on which to layer in a few statement-making pieces and cozy classics suited to modern bachelorhood. Masculine staples mix with curvaceous midcentury finds in the living room, where a caramel-sheathed egg chair and vintage zig-zag seat vie for attention. A Restoration Hardware sofa is topped with custom leather cushions and framed by a pair of brass library lamps. The recipe is echoed in the guest room, with one significant twist. The minimalist paint treatment—a chair-rail effect without the rail—echoes a traditional style but in an offhanded, cool iteration, a subtle homage to old Brooklyn and new. 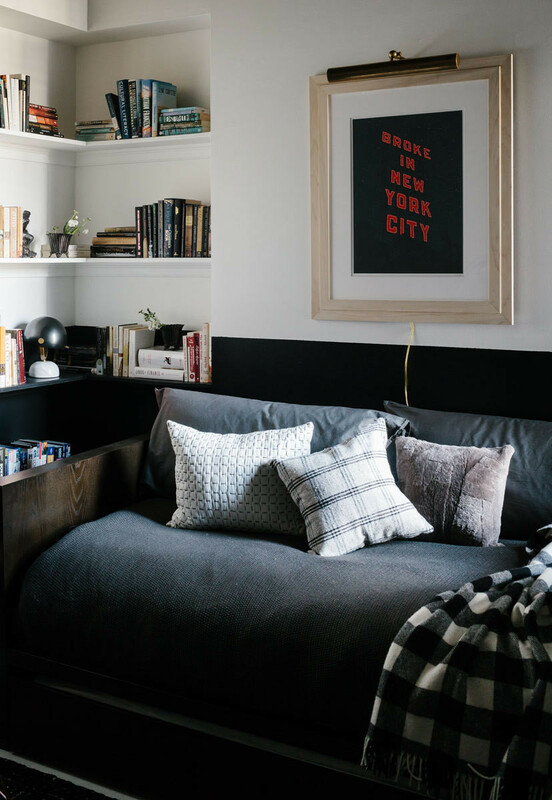 A West Elm daybed, a cheeky print found on Etsy, and an artful copper chair from Bend Goods round out the diverse space. A simple paint treatment makes an unexpectedly bold statement in the guest room. 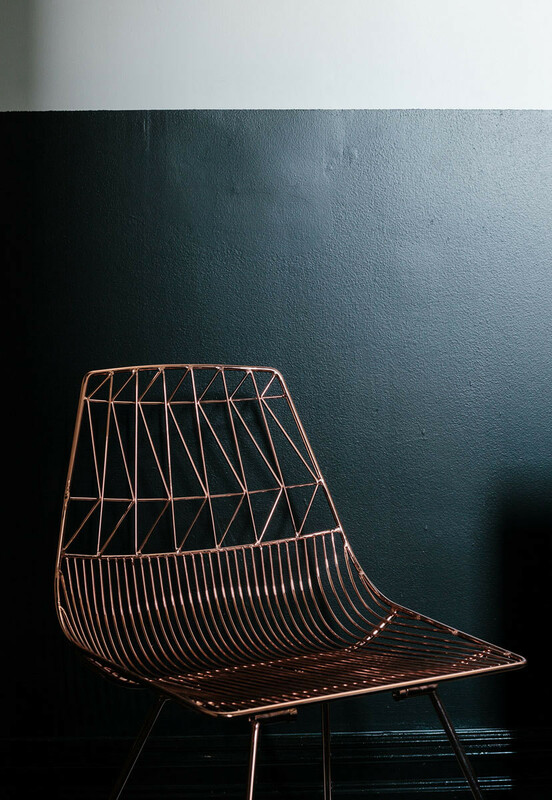 A copper Bend Goods chair in the guest room doubles as sculpture. Painting the wood floors in a glossy white not only creates a lofty, gallery-like feel in Mazia's small space, it allows shapely furniture to take center stage. 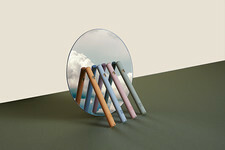 It's a bold design statement that teaches visitors to expect the unexpected. Take a look at the tile floors in the bathroom. A super bold pattern makes even more of an impact when used in tight quarters, while not overwhelming the overall design of the apartment. 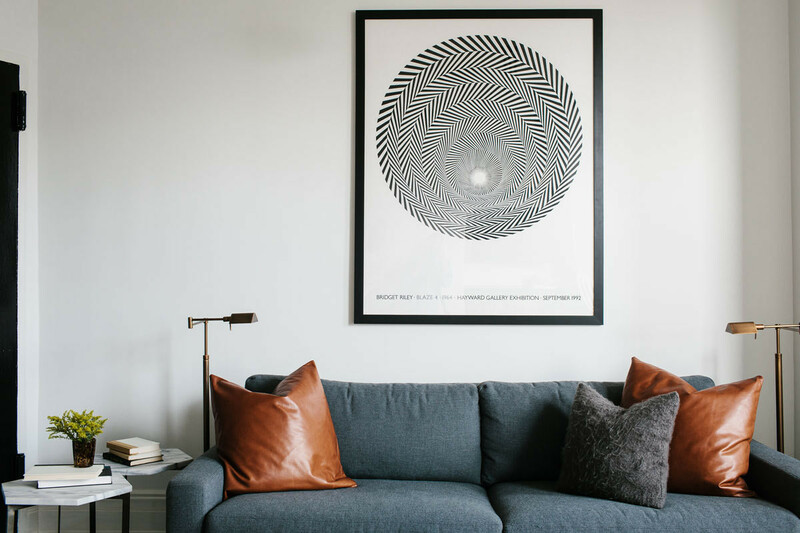 Especially when rendered in black and white, a repeated rhythmic print, such as the one found on the living room rug and mirrored in the gallery poster on the wall, reads as a texture to be layered on, rather than a pattern to be competed with. Warm-toned metallics like gold, brass, bronze, and copper are the best complement to black, white, and charcoal gray. Their yellow or pink undertones add another chromatic layer without sacrificing an all-neutral scheme.